Caption: These are the Chillicothe R-2 District Teacher if the Year and the Teacher of the Year nominees. Pictured are, front row, from left: Tammy Price, fifth grade Central School teacher; Teacher of the Year Rosie Smith, special education teacher at Field School; Terri Willard, Chillicothe Middle School communication arts teacher. Back row, from left: Ed Douglas, Chillicothe Education Foundation president; Arch Hasler, auto collision repair instructor at the GRTS; Nancy Nowland, Dewey School kindergarten teacher; and Dale Wallace, R-2 Superintendent. Not pictured is Dorlene Meneely, Chillicothe High School art teacher, who was unable to attend the event because of illness. 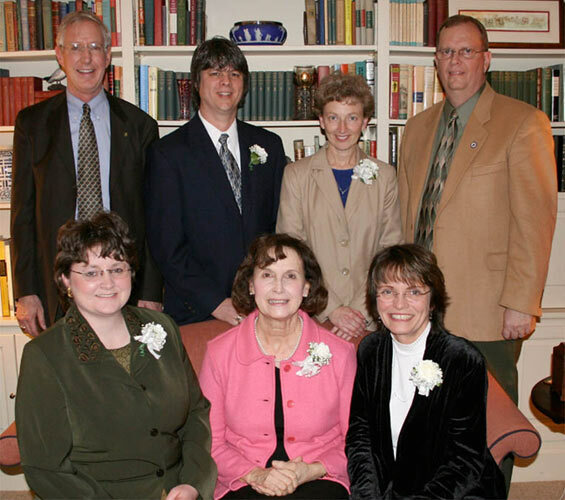 Over $14,000 was raised on the night of January, 18, 2006 at the home of Ed Milbank during the Chillicothe Education Foundation's annual dinner. More than 100 people attended the event, which set a fund-raising record for the foundation. The funds raised are used to encourage excellence in education through honoring the district's outstanding teachers and funding the foundation's Mini Grant program. 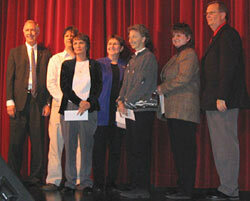 The foundation also annually awards several scholarships to students. "The Education Foundation helps benefit our schools and make them a little better than they already are," Ed Douglas, president, told the crowd. He added that the foundation also worked in recent years to raise funds to purchase the 60 acres of land north of the high school where the district may move all of its buildings someday. He went on to thank those for attending the dinner, which he termed as one of the premier social event of the year in Chillicothe. 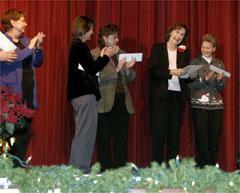 Caption: In the 14th annual awards ceremony held at the Gary Dickinson Performing Arts Center on Monday, December 5, 2005, Rose Smith of Field Elementary School was named the CRII Teacher of the Year. Rosie has been teaching for 20 years with seven of those in the Chillicothe School district where she teaches Special Education to 2nd and 3rd grade students. "I accept each child as they are, let them know you like and respect them, take them by the hand, and challenge them to work their hardest and be the very best they can be." Rosie was recognized for her kind, quiet, and optimistic personality, always having a smile and cheerful word for her students and her colleagues. Photo courtesy of Field School 12 06 05. The Chillicothe Education Foundation awarded Rosie and the other five teacher nominees $10,000 to help them in their classroom and award them for their dedication to their profession and excellence in the classroom. Each individual received $500 in cash and $1000 for educational supplies, equipment, or professional development. The Teacher of the Year received $1500 cash and $1000 for educational items. Each building nominated someone to represent their facility. From Garrison and Dewey Elementary, Mrs. Nancy Nowland has been teaching 20 years with the last 10 years in Chillicothe where she teaches Kindergarten at Dewey Elementary School. She gets great enjoyment from the warmth that comes from the sparkle in a child's eye as they sound out a word for the first time and realize they can read. Mrs. Tammy Price represented Central Elementary School. Mrs. Price has been teaching 14 years with the last 10 years in Chillicothe. She was a Special Ed teacher for grades 4 and 5 for her first seven years and has taught 5th grade at Central School her last three years. Her approach to teaching was summed up in one word - passion. She strives to create a passion for learning that is as great as her own. 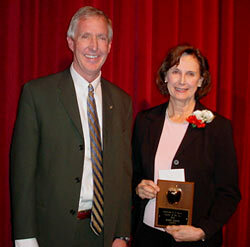 The Chillicothe Middle School teacher was Mrs. Terri Willard. She has been teaching 33 years with the last 25 years in Chillicothe, the last 10 teaching Communication Arts in the 7th and 8th grades. She believes every student has the potential to do great things and that her job is to get them to believe it. Her colleagues know her to be a tireless and selfless educator who always puts her students first. Mrs. Dorlene Meneely was nominated fro the high school Mrs. Meneely has been teaching 29 years with 22 of those years in Chllicothe where she has taught art at Kindergarten through grade four for nine years and at the high school for the last 13 years. She brings a level of energy and enthusiasm to her classroom that is truly remarkable. Her teaching centers on helping students become responsible learners, helping them however and whenever they need it. Mr. Arch Haslar was the nominee from the Grand River Area Vocational Technical School. Mr. Haslar has been teaching for 9 years with all nine being in the Auto Collision Technology classroom at GRTS. The greatest reward for him walks through his door every day - his students. He not only teaches his students collision technology, but also teaches them about the importance of being able to provide for themselves and their families. His students are always prepared for the next step in their careers, both technically and academically. Also announced at the awards ceremony was the fact that the Hedrick and Lawson Foundations will be proceeding with the air conditioning project at Dewey Elementary, with preliminary work beginning in December, with the work bid out in late January to early February. By next August, Dewey will begin school in air conditioned comfort. The Chillicothe Teacher Association hosted the reception, serving cookies and punch after the award presentation. 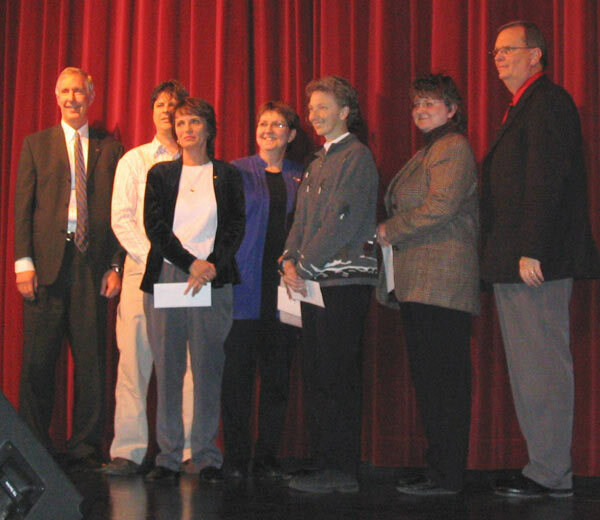 CAPTION: The auditorium broke out into applause as Rosie Smith (second from right) was named the 2005 R-2 Teacher of the Year during the annual awards ceremony held Monday at the Gary Dickinson Performing Arts Center. The special education instructor at Field School was among six teachers district wide nominated for the honor. As the Teacher of the Year, Smith receives $1,500 cash and $1,000 for education items from the Chillicothe Educational Foundation. Those nominated for the award received $500 cash and $1,000 for educational supplies, equipment or professional development, also courtesy of the Chillicothe Educational Foundation. Several R-2 employees and teachers were honored Monday during the 14th annual Teacher of the Year program held at the Gary Dickinson Performing Arts Center. District Superintendent Dale Wallace served as master of ceremonies and aided by R-2 board president David Williams, the two honored several district employees for their years of service. However, the highlight of the half-hour event occurred at the end of the program with the announcement of the 2005 Teacher of the Year. That award went to Rosie Smith, special education teacher at Field School. "I never, in my wildest dreams thought something like this would happen to me," Smith said, shortly after receiving the award. She added, "I have long believed that you're only as good as the people you work with and I've been privileged to work with a wonderful bunch of people." As the 2005 Teacher of the year, Smith receives $1,500 cash and $1,000 for educational expenses from the Chillicothe Educational Foundation. Ed Douglas, foundation president, made a few brief remarks and handed out awards totaling a combined $10,000 to Smith and the other teachers nominated for the award. Douglas noted that every year, he relishes the opportunity to honor the "best of the best" within the R-2 school system on behalf of the Chillicothe Educational Foundation. "What teachers do is extremely significant in that they help mold and shape our youth," Douglas said. He explained that the foundation also works to encourage excellence in education through its Mini Grant program and the administration of several scholarships. In announcing Smith as the 2005 Teacher of the Year, Wallace explained that the special education teacher possesses three important qualities that distinguish her as a great teacher: A truly caring attitude and willingness to go the extra mile to guide a student to their highest potential, a compelling desire to share her time and knowledge and discover, along with her students, all of the unknowns of the world, and the dedication to search for new approaches that will meet the need of every child. "The 2005 Teacher of the Year has been described in many different ways... a tireless worker, kind, professional, positive, creative, eager to help and dedicated," Wallace told the crowd.